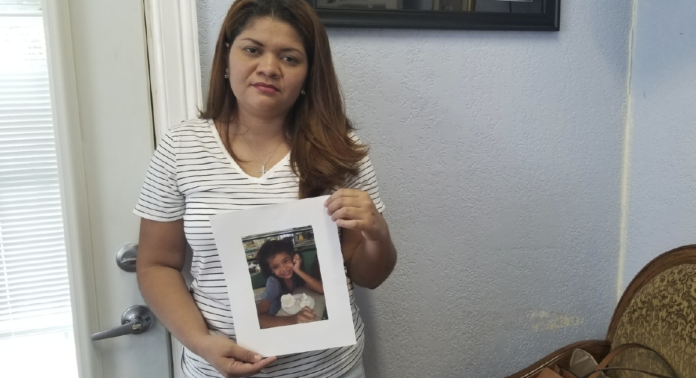 HARLINGEN — Cindy Madrid’s suffering started when her daughter Alison was taken away from her after crossing into the United States last month. Cindy ended up in a detention center in Port Isabel on June 14, without a clue as to where Alison, 6, had been taken. And while Cindy was locked up waiting to see a lawyer, Alison was attempting to contact her aunt from inside a Southwest Key shelter in Phoenix. Alison’s voice would later be heard around the world in an audio recording released by ProPublica of children crying in a shelter after being separated and wanting to reunite with their mother and father. In the audio, one shelter employee can be heard comparing the mass crying to an orchestra. Then Alison’s calm voice emerges in the midst of all the crying and despair, asking permission to call her aunt to come get her. The 6-year-old Salvadoran had her aunt’s phone number memorized. Her voice and calm cry for help triggered a worldwide outrage to reunite families. President Donald Trump signed an executive order to reunite children with their families after they had entered the county illegally on June 25, nearly a week after Alison’s voice and the sound of babies crying went viral on the Internet. And now after more than one month of being separated, Cindy and Alison hope to be reunited and enjoying pizza for dinner this weekend. They spoke over the phone Thursday for the first time since being torn apart. Cindy and Alison are one of the many families who were separated and sent to centers and shelters in various parts of the United States. “Hopefully, they will release the baby on Saturday or as early as today,” said Thelma Garcia, Cindy’s attorney in Harlingen. Cindy’s story is like many others. She had traveled what she said was a safe 1,000-mile trek from her native country of El Salvador seeking asylum for fear of persecution or torture. She said in her interview with an asylum officer that an MS-13 gang member who had murdered her boyfriend threatened to take her daughter away if she didn’t move away. So she desperately paid $7,000 to be taken to the United States border 1,000 miles away from El Salvador. And today she will be traveling another 1,000 miles to find Alison in Arizona. The two were separated from each other by U.S. Border Patrol agents after crossing into the United States on June 11 near the Hidalgo and Reynosa border. Cindy was released Wednesday from the detention center located near Port Isabel after posting a $2,500 bond. The bond was paid for by fundraising to help Cindy, Garcia said. “Since she is the mother and she is released it is going to be easier for her child to be released than mothers who are not released,” Garcia said. She said they did not know where Alison was right away.